At the top of the Force collection is the Force Waterproof Tactical Boot 152001. This boot features the latest slip-resistant outsole platform and comes with waterproof bootie construction to keep you dry and comfortable at all times. 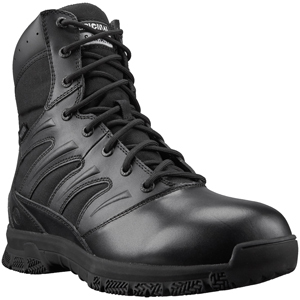 Original SWAT Force Men's 9in Waterproof Tactical Boot 152001 features a 100% full grain leather with polishable heel and toe and Cordura 1000 denier nylon upper for lightweight toughness. A foam padded collar and tongue gives cushioning and comfort while a gusseted tongue keeps dirt and debris out. This Original SWAT boot is extremely supportive and sports a custom-molded thermoplastic heel counter and toe box for maximum comfort and lateral support. A classic outsole is slip and oil-resistant, non-marking rubber, exceeds the ASTM F2913-11 test standards. For a tough lightweight zipper boot that is the ultimate value for those uniformed professionals working in wet conditions, the 152001 boot is a top contender.